Just a quick update with the Midnighter run, Garth Ennis has left as writer replaced by Keith Giffen. There is also a new art team by the names of Chris Sprouse and Karl Story. The stories take place with the Midnighter trying to understand his past, he is able to track down information about the town he grew up in, Harmony. To his surprise it’s a ultra patriotic town, run by a bizarre national security cult called Anthem. Basically guys in suits with American flags stuck on their faces, is Giffen having a dig at the Patriotic Act? Over insulated America values and the paranoia of national security? 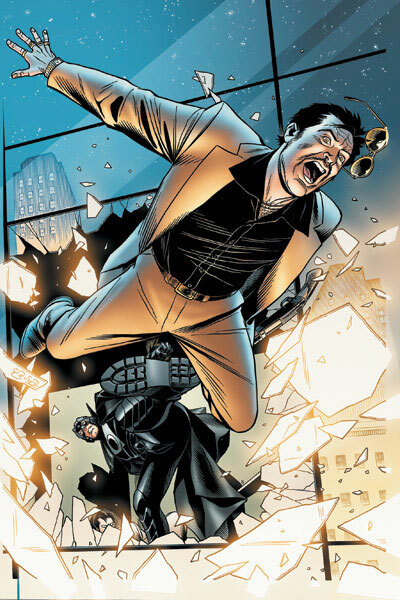 In the mix is our favourite rogue homosexual good guy and killer of bad guys, the Midnighter. We soon learn once entering the town he is going to be set up (by Anthem) for a ‘situation’ involving an adversary. Suffice to say, this whole event is to make the Midnighter look like a criminal or enemy of patriotic values etc. The aim? So new laws can be introduce to reign in the Authority (Midnighter’s team). Giffen gives the Midnighter’s character a little more depth in these stories, so it’s great that Wildstorm is allowing a character like the Midnighter to evolve independently from the Authority. Because he is an interesting character with a lot to offer, especially now with Giffen mixing in themes of so called American values, manipulated media, and the exploitation of social/society paranoia. This is good comic, the art is fluid and gives good pace to the story Giffen seems to enjoy the development of the Midnighter character. But overall the bizarreness is there, a crazy patriotic cult, a cynical Midnighter uncovering a plot to defame him and with Midnighter’s trademark violence against the real evildoers of the world. For the original Spotlight on Midnighter, please refer here. This entry was posted on October 17, 2007 at 12:19 am	and is filed under Books, Comic Reviews. Tagged: Keith Giffen, Midnighter, Wildstorm comics. You can follow any responses to this entry through the RSS 2.0 feed. You can leave a response, or trackback from your own site.